There is also a similar triangle symbol on the gauntlets and helmet (inversed) between Freya and the Saxon Clan. If Freya is really associated to the wolf Fenris and knowing Dave Filoni's love for wolves, it could hint of her importance later in the show. Titles of the first four episodes . Episode 05 - "The Hight Tower", (28 october). I don’t know about other countries . In US it’s 30th September. The series will premiere on the Disney XD channel in the UK this October, following its US debut on the Disney Channel on the 7th October. Oscar Isaac (“Star Wars: The Last Jedi”) as Poe Dameron, Jim Rash (“Community”) and Bobby Moynihan (“DuckTales”) as Flix and Orka, respectively. Gwendoline Christie (“Star Wars: The Last Jedi”) as Captain Phasma. Elijah Wood (“The Lord of the Rings” trilogy) as Jace Rucklin. Donald Faison (“Scrubs”) as Hype Fazon. Thanks for the update . So now even more of a wait ( no UK start date at all except “ sometime in October “ and it’s delayed in US ). Will have to watch tv schedules like a hawk to ensure I don’t miss it . For people like me who have difficulty remembering character's name, face or other facts, those cards are really useful. I hope they'll make those for other characters. Sneak Peek of the first episode. I like the humour and the characters so far. Looks like the MF is not the only piece of junk of this Galaxy. Hi All, was listening to the latest 'Full of Sith' podcast today [here]- it's a series of interviews from a press junket for the resistance. The reporters were shown a few episodes, and then interviewed cast members, executive producers etc. When Christopher Sean is being interviewed one of the reporters asks a question stating that Kaz's dad is a senator. CS is cagey - oh really? Is he? are we suppose to talk about that? kind of thing. it got awkward! lol!!! It seemed to me that was a leak. but have a listen and decide for yourself! One other reveal- an executive producer revealed the timeline of 6 months before TFA was chosen for a few different reasons - 1 reason being so there could be cross over between the resistance content and TFA in the timeline. I may have missed it but this was the first time I'd heard confirmation of how far into the future the resistance timeline reached. I'm not sure I'll even have access to be able to watch it.. so I'll be keen to hear what viewers think! @DeeBee wrote: Hi All, was listening to the latest 'Full of Sith' podcast today [here]- it's a series of interviews from a press junket for the resistance. The reporters were shown a few episodes, and then interviewed cast members, executive producers etc. I don't think Kaz's father as a senator is a leak. It was revealed by Exec producer Justin Ridge (or else the producer talked too much ). I hope for Kaz that his father wasn't on Hosnian Prime 6 months later. Torra Doza has the same problems with her father, so I think this sentiment will help them to become closer. And once again, the heart of the characters conflict is "Daddy's issues". SW really never change. It's nice to have hints about the timeline of the serie. I bet we will see Starkiller's desctruction in Resistance. Before, we had countless retellings of the Death Star's destruction, now, it is Starkiller's fate. Oh I see so that cat's out of the bag huh! Thanks for this! I think the reporter suggested Kaz has much in common with Leia. I think the most interesting comparison would be between Kaz and Ben Solo - both had a senator parent, and both had a wealthy upbringing (I figure Leia would have been at least reasonably well off?!). But I guess the take away message is going to be when all combined - how you start doesn't matter.. wealthy, humble- whatever! What matters is how you finish and the choices you make in life. Rofl yeah those daddy issues. Ugh!!! I was thinking episode IX would turn the tables on this, but with reduced Leia footage to draw on I'm no longer sure what to think.. just going with the flow! Lady Gaufrette, do you think you'll be able to watch resistance when it airs? I guess its just a few more days to go and then I'll be seeing if I can access it somehow! Ben and Kaz. I'm waiting to see if Kaz also has an important legacy. 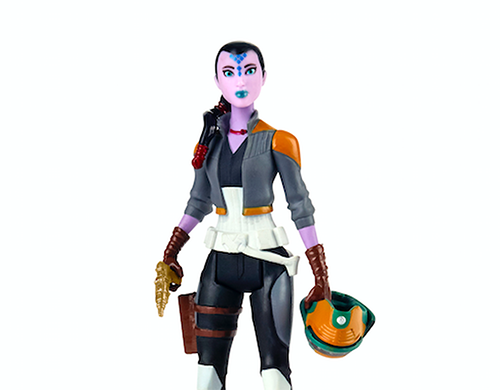 Apart from Sabine and her mother, was there other characters with mommy's issues? There is also Ben and Leia, but for me it's not the same thing, they don't appear to have the same problems as Ben and Han. I don't know yet if I'll be able to watch Resistance, I'll answer you the 7th. New characters revealed thanks to... toys! Unlike Star Wars: The Clone Wars, it doesn't revolve around a massive war — it's set before the real with the First Order begins. Unlike Star Wars Rebels, there's not much to rebel against. In Resistance, the New Republic is well-established and the First Order is but a whisper on the lips of those who believe it exists. But the series starts only six months before TFA, correct? The FO really is a recent startup. Really makes me wonder if Kylo really had the opportunity to do that many dark deeds with Snoke at all. They also say here it will overlap with TFA, and I wouldn't be surprised if it does with TLJ too. @LadyGaufrette wrote: Titles of the first four episodes . She was one of the pirates in "The Triple Dark" and with this title may become a recurring character. I saw 4 episodes of Resistance. My thoughts so far. With the pilot episode being two episodes but being broadcasted as one episode, I guarantee problem later for the episodes and their true numbers in the list by casual people. I already said it last month but, all those colours brighten my mood it's so refreshing. Some people complain the colours are too much flashy, I don't care. I'm so happy too see all those colours and this light, and what happens on the screen (looking at you Solo and most of dark blockbusters). Tha animation is really good when compared to other productions in cel shading. The flying of the ships is fluid. Kaz's grimaces are over-exaggerated, but it reminds me of japanese anime so I'm ok with it. Some backgrounds feels like matte painting, it's great. 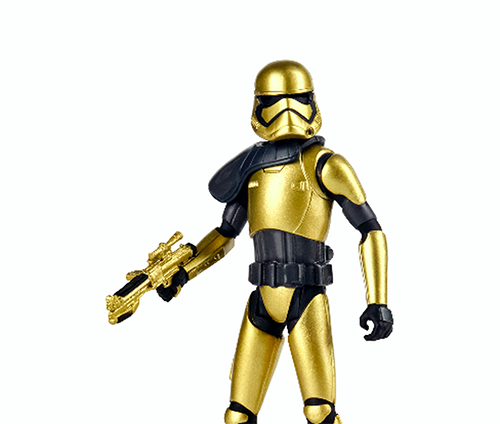 Concerning the story, you see some Resistance and FO but really quickly (some seconds), but Phasma is beautiful in this serie. It's centered on Kaz and the races rather than what happens with the FO, but it's what had been promised from the start. Futhermore, FO will have a more prominent role in episode 5. Kaz makes a lot of goofs but I like him, he's less unbearable than Ezra. His father is a senator but we don't know how he looks like, so I foresee drama with the FO later. I love Neeku, he is so much more funny than Drax in the way he only understand first degree of talk. Sadly we didn't see the Aces often, even Torra Doza. I hope to see them more later. However, this serie feels so alive, there are various aliens everywhere. I'm glad to see an Aleena speaking even if he isn't a great guy. I saw a "R2-D2" blue and yellow, I hope to see it often. Me when I saw "Star Wars Resistance: Meet Team Fireball"
Good news, I had good eyes and feeling because C4 is awesome. Bad news, he disappears once Kaz in on the Colossus. Goodbye droid of my heart. So far, I'm happy with this serie and I want to know what happens next. It's fun and lighthearted which I consider the spirit of SW. It's aimed at kids but adults who kept their childish soul can also like it. I enjoyed the first few episodes but the show hasn’t hooked me yet. With Rebels, I got pulled in right away. The show has a lot of potential though. I’m excited to see where it takes us. My favorite character so far is Tam! Neeku is a close second. His personality is super cute! @californiagirl - I'm thinking the FO was not a recent start up.. but they had only recently started to come out of the shadows.. They were amassing for years in the outer rim, hiding their true nature and capabilities. I'm curious to see what is known of them at the time of resistance. I"ve gone back to the start of the Poe Dameron comic series to read them all.. it's interesting to see early FO in that..
Is early FO in anything else? I haven't had a chance to watch resistance yet... not sure how I'm going to see it! But I'm loving hearing from people who have! @LadyGaufrette - thanks soooo much for sharing all this fab info LadyGaufrette! @TheBastardofMandalore -great to hear your thoughts too! @DeeBee wrote: @californiagirl - I'm thinking the FO was not a recent start up.. but they had only recently started to come out of the shadows..
@DeeBee-- Leia is getting an inkling of the FO's beginnings in the novel Bloodline by Claudia Gray, which I highly recommend! @12 Parsnips Oh yeahhhh thanks I'll read that one next! I'm yet to finish thrawn alliances but am enjoying it! (and the story). I really wasn’t expecting to feel this engaged with the series so soon - it can only get even better I think from here onwards . I really like the animation style too- the visuals are colourful and fun. Another thing I really I love about all the animated series( clone wars and rebels ) is how they bring to life the droids and aliens in the Star Wars universe and really give them distinct personalities and importance as well as the humans - looks like resistance is no exception . The resistance really felt like it was a mish mash of different personalities and humans and aliens from all walks of life and kaz’s background is interesting too ( sounds similar to Ben Solo’s with his dad a senator ) with his father saying how he thought the resistance were terrorists( and wasn’t happy Kaz had joined them )leaving room for some family conflict further down the line. Am really looking forward to watching the rest of the series and finding out more about our main characters , more about the first order too. Can’t wait to see what happens when kaz goes undercover as a spy . Love what have seen so far . We don't know yet if Kylo will appear in the serie, but he is a popular character so he should in my opinion. The only information I found online about Adam voicing Kylo is coming from Mike Zeroh, did you see a more serious source ? I'll tag you on the topic if/when I found in what episode Kylo appears. Jakku and Batuu make appearances, courtesy of holographic images in Yaeger’s office in the “Fuel for the Fire” episode. 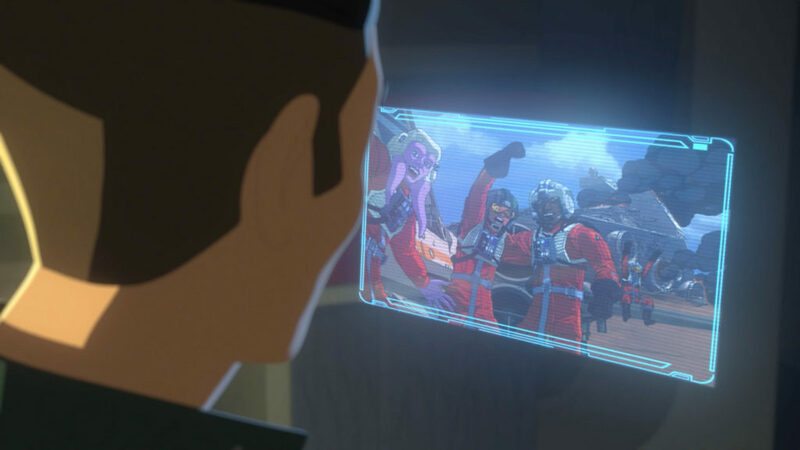 The holographic image Kaz finds in Yaeger’s private office shows him as part of a victorious X-wing squadron at the Battle of Jakku. A downed Star Destroyer rests in the desert behind him, as seen in Star Wars: The Force Awakens." 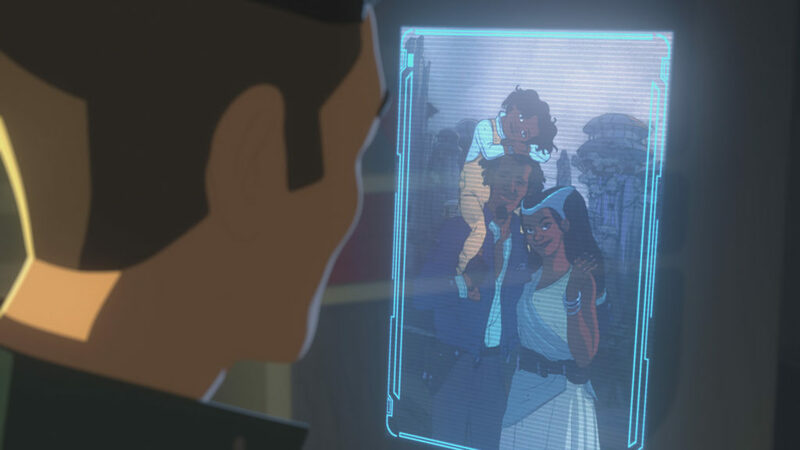 The photo of Yeager’s family was taken on Batuu — the same location featured at the upcoming Disney Parks Star Wars-themed land, Star Wars: Galaxy’s Edge." I was slow in watching this episode, so when I read the starwars.com article, I thought - now is the time. Only a tease, yet very cool. 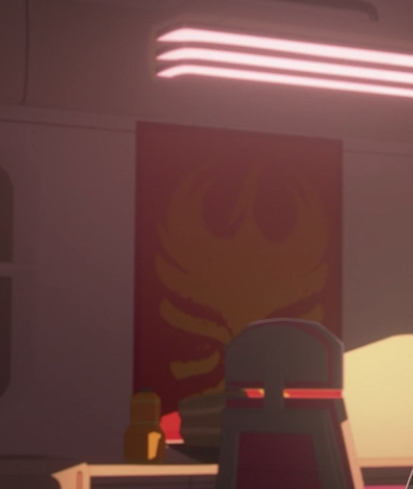 Torra Doza has a piece of Sabine Wren’s artwork, the Phoenix, in her room. Pretty cool! From episode “The High Tower”. Is that baby Finn in that Batuu photo? !